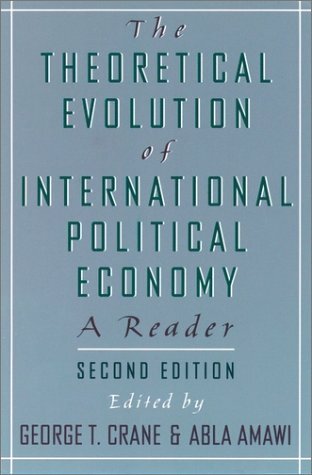 This collection of seminal readings in international political economy charts the historical and theoretical evolution of the field from the eighteenth century to the present day. Bringing together classic works and leading contemporary arguments, this book outlines the development of three schools of IPE thought -- Liberalism, Marxism, and Realism -- and also includes recent syntheses of these approaches to show how conventional theoretical categories are giving way to more eclectic conceptual schemes. The second edition features an added section on the "postmodern turn" and several new readings are included as well. Classical Mercantilism: Alexander Hamilton, ""Report on Manufactures""
Friedrich List, ""Political and Cosmopolitical Economy""
Classic Liberalism: Adam Smith, ""Of the Principle of the Commercial or Mercantile System"", ""Of Restraints Upon the Importation from Foreign Countries of Such Goods as can be Produced at Home""
David Ricardo, ""On Foreign Trade"". Marx and the Early Marxists: Karl Marx and Friedrich Engels, ""The Communist Manifesto""
Karl Marx, ""The Rise of Manufactures"", ""On Imperialism in India,"" V.I. Lenin, ""The Export of Capital,"" ""Imperialism as a Special Stage of Capitalism."" Revisions of Liberalism: Interdependence Theory: Richard Cooper, ""National Economic Policy in an Interdependent World,"" Robert O. Keohane and Josep S. Nye, ""Interdependence in World Politics,"" ""Realism and Complex Interdependence."" Revisions of Marxism: Dependence and World-Systems Theory: ""Christopher Chase-Dunn, ""Interstate System and World Economy: One Logic or Two? "", Robert Cox, ""Global Perestroika."" The Return to Statist Theories of International Political Economy: Robert Gilpin, ""The Politics of Transnational Economic Relations,"" Alice Amsden, ""The State and Taiwan's Economic Development."" Rational Choice Analysis: Mancur Olson and Richard Zeckhauser, ""An Economic Theory of Alliances"", Bruno Frey, ""The Public Choice View of International Political Economy."" Hegemonic Power and Stability: Immanuel Wallerstein, ""The Three Instances of Hegemony in the History of the Capitalist World-Economy,"" Susan Strange, ""The Future of the American Empire."" Regimes and Epistic Communities: Donald J. Puchala and Raymond F. Hopkins, ""International Regimes: Lessons from Inductive Analysis,"" Peter Haas, ""Do Regimes Matter: Epistic Communities and Mediterranean Pollution Control."" Postmodernisms: David Harvey, ""The Condition of Postmodernity,"" Michael J. Shapiro, ""Sovereignty and Exchange in the Orders of Modernity.""